ZERAMEX Ceramic Dental Implants offer durability and a fitted, comfortable attachment. Implants are initially surgically placed and healed within the jawbone. With ZERAMEX specially designed carbon screws the potential of bacteria build-ups and infection is minimised, making at-home oral care for patients far much easier. The white colouring of the Zeramex Ceramic Dental Implant is especially designed to blend naturally with the crown above. In addition, zirconium dioxide is known to promote better blood circulation to reduce plaque and deliver anti-inflammatory properties to the surrounding tissues. ZERAMEX implants offer durability and a fitted, comfortable attachment. 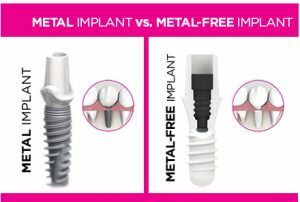 Thanks to their two-part system, implants are initially concealed and healed within the jawbone allowing for greater flexibility and freedom and more importantly unlike the titanium implants, ZERAMEX does not lead to metallic corrosion or react negatively to your body’s biological functions. Find out more about Singapore Metal Free Dental Implants and why we use the Zeramex Ceramic Dental Implant at the The Dental Implant Centre.